Lost Atlases: Map: Pitax, Mivon and the Stolen Lands at 12mi to the hex with some geographic and geologic notes. Map: Pitax, Mivon and the Stolen Lands at 12mi to the hex with some geographic and geologic notes. Pitax, Mivon and the Stolen Lands at 12 miles to the hex. The full map can be downloaded here. It's here! The completed map of Mivon, Pitax and the Stolen Lands at 300 dpi. This should be suitable for using as a background in VTTs like roll20 or as a large handout / foldout for the tabletop. Restov is placed where it would be in the Kingmaker AP, approximately 50 miles east of where it would be on the Brevoy map. There is no resolving that corner (where the Stolen Lands, the River Kingdoms, Brevoy and Iobaria meet) so I've worked from the perspective of the most detailed map to the least. Mivon is listed as having several settlements between Mivon city and Sarain to the west. These are described as village sized settlements. The Branch of the Sellen River bordering Mivon and the Stolen Lands is unnamed. I've attributed the name Mivon Branch of the Sellen to that waterway. 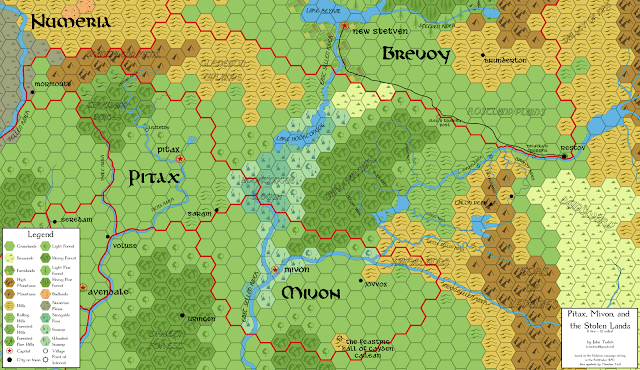 Mivon's border with the Stolen Lands encroaches on the bottom row of hexes in the Kingmaker AP. However, Mivonese claimed lands do not overlap any of the AP encounter areas. Furthermore, Mivon's ability to enforce their rule north of the Mivon Branch of the Sellen is questionable. Brevoy has numerous villages along the East Sellen River and in the vicinity of New Stetven. These are unmarked on the map. The overall topography of the stolen lands is U-shaped going from the Glenebon uplands to the Tors of Levenies with the lowest point of the U in the Hooktongue Slough. The Hooktongue Slough is consistent with a type of drowned terrain which was the result of recent glaciation following Earthfall. Similar types of terrain can be found all over the world in the wake of retreating ice-sheets - particularly in North America (Canada and the United States) as well as northern Europe. Furthermore, it could be reasonably expected that there are numerous small lakes and ponds (known as kettles on Earth) scattered throughout any of the grasslands terrain in Brevoy, Mivon Pitax and the Stolen Lands. The Dunsward may be an exception to this rule as the glaciers may not have gone east of the Tors of Levenies. The sediment in the lowlands of the Stolen Lands, Mivon, Pitax and Brevoy is mostly glacial in nature. Glacial sediment is an amalgamation of dirt and stones of all sizes mixed together. It is deposited by retreating and advancing glaciers, in a manner somewhat like a giant bulldozer. Sediment of this kind is most frequently found in the flat, grasslands where the bulldozer effect has smoothed out any previous topography by filling in the valleys and scraping off the ridgetops. Wells driven into this sediment are usually good producers of water, leading to successful farms, even away from rivers. Moreover, glaciers drag rocks from distant places to the Stolen Lands, meaning that there is always some small chance (like 1 in 10,000) of finding some unusual rock randomly. Moreover, the presence of minor ore deposits in the Stolen Lands suggests that there may be more of the same in the Tors of Levenies to the East. Placer hunting for gold in the tributaries of the Gudrin and Little Sellen are certainly possible! The next step in this process (barring any revisions to the map brought up by the community) is to have a second map made showing the location of the overland encounters in the Kingmaker AP oriented to the new hex grid. Following that, I'd like to take a short break and work on a couple dungeon maps (I have a few fun ideas!) that I will then share here. Following that, it will be time for another hex map. Which begs the question - what part of the Inner Sea would you like to see made into a hex map next? Leave a reply in the comments and I'll do the country that has already been detailed in a Campaign Guide with the most requests.